→Brother LS2125i Review – Is it worth buying? When you are just starting with a previously unexplored activity, it can become quite difficult to figure out the best product with which to commence the journey. Does it have the right balance of cost and features? Would you outgrow it too quickly? Should you splurge on something more advanced to begin with to get it over with? If such doubts are percolating in your brain, Brother, known for its wide selection of computer printers and scanners, will remove them with their amazingly priced LS2125i model. Let’s dive into this in-depth Brother LS2125i review on why that is the case. Although fully-sized, it is lightweight and highly portable, so you don’t even have to arrange for a dedicated working space as it can be easily moved around after each use. Its 10 essential built-in stiches are just the right range to not overwhelm, and instead focus you on mastering what is there. Of the 10, the main focus is on stretch, zigzag, and blind hem stitches. It is intuitive thanks to its illustrated dial and printed diagrams of what is available. A glance will be enough to cycle through all the options, after you have quickly familiarized yourself with the operation’s manual. Which available in both English and Spanish. Albeit a 4-step buttonhole, it is still automatic, allowing you to create perfectly sized buttonhole every single time. The 2125 model is exceptionally priced, basically equaling to one week’s worth of groceries for a small family. Easy stitch selection on the fly with a dial. Easy stitching tension control that prevents those frustrating puckered and loose finishes. Turning the dial to the right increases the tension, while turning it to the left decreases the tensions. This gives you on-the-fly flexibility to work with variedly thick materials, from silk to denim. As simple as it can get! Lever for reverse and forward stitching. Included presser feet for a greater degree of control, including for bobbin winding. In short, within a single day you will be completely familiarized with the workings of the LS2125i, giving you enough confidence to continue elevating your newly-found sewing craft to new levels. 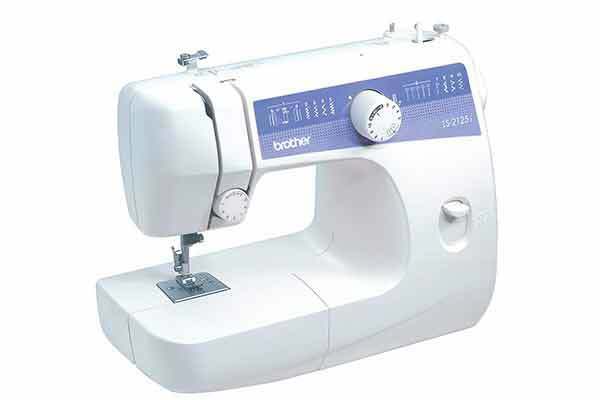 Likewise, that alone makes the LS2125i by Brother a perfect gift to give, as a beginner, but competent, sewing machine. Presser feet: button-making, button-fitting, zipper. This is in addition to the foot controller pedal. Additionally, the sewing machine itself has a nifty storage compartment in which you can place most of these accessories, and other items. Due to not being bombarded with hundreds of stitches and other features you could find in more expensive sewing machines models, your productivity will be apparent within a day’s work. Effectively, the novice friendly LS2125i makes it possible to switch from the usual process of figuring out how a machine works to instead using it as a tool – an extension of your hand and mind. Just the way it should be. Alongside the previously mentioned dial, with which you easily control tension and select stitches, you can also control the stitching speed with the included foot pedal, which has 3 speed settings. The automatic buttonhole 4-step process is enough to make you feel like an expert already! No matter if you want to fix heavy coats, shirts, pants or sweaters, the buttonhole feature will make it a snappy task, especially when you decide to use the two presser feet for this specific task. On another note, it is worth mentioning how safe the sewing machine is. Its lightweight design makes this possible but without being unstable and wobbly during the operation. As such, it is suitable for use with kids and in tight spaces. Brother indeed distributed the weight at just the right points to make such stability possible. With every product, the overall ‘score’ of the item largely depends on how competently you end up using it, but going through the received feedback, you may want to pay attention to bobbin winding as it may not perform correctly on some occasions. Additionally, the threading may sometimes lock beneath or on top of the fabric. However, given the overall positive accumulation of reviews, most of such reports are likely come about as a result of improper use and impatience. When it comes down to it, the price alone makes Brother LS2125i an outstanding deal. The machine performs competently in all the tasks one would require to either repair clothing or make a new one. To put it into perspective, this machine is superior to any your mother or grandmother have ever used by the sheer virtue of being created as a modern sewing machine. True, it doesn’t have more advanced features like full computerization or high range of built-in stitches, but for a beginner this is a blessing, not a downside. Looking at it from that perspective, and considering its convenient lightweight and portability, alongside getting a sewing machine from an established brand like Brother with great support, it should be considered as one of the top models for beginners. In the end, if you later decide that you need an expert-level machine, it will still serve you as a backup or even as a handed down gift option, one that will be valued thanks to its formidable utility and user-friendliness.